The two men with the wavy, slicked-back hair could pass for your typical father and son until you take a closer look. Dressed in white-studded jumpsuits, they have a swagger in their hips, belt out golden oldies and capture the hearts of many in dimly lit lounges throughout the tri-state area and beyond. What makes them unique is their musical mimicry recreating the sounds and sights from the King of rock ‘n’ roll — Elvis Presley. When the one-year gig finished, he moved on to perform in Joe Franklin’s Oldies Review Show in Atlantic City and The Palms Casino Resort in Las Vegas. Along the way he found time to book other performances within Gregg Peters has been singing Elvis tunes for more than 40 years and now his son Lamar Peters, 25, is following in his footsteps. Gregg got started in November 1977 — just three months after Elvis’ death — at the Riverboat Restaurant in the Empire State Building, performing six nights a week. He still remembers the place being packed and smoky with the audience swaying and swinging to the oldies. the five boroughs and out on Long Island. The senior Peters has a theory as to why he, and now his son Lamar, continue to attract an audience even in this modern musical age. The Peters both grew up in Astoria and now currently live in Middle Village. Lamar Peters has been singing and dancing since the tender age of 5. He believes that after Elvis there was nothing in terms of music that can live up to his standards. He has some advice to other Elvis tribute performers about keeping up with modern times, which he adapts for his own life. Lamar Peters got his start at the B. B. King Blues Club & Grill on West 42nd Street in Times Square performing Las Vegas-casino style Elvis concerts. He explained that he likes some modern rock and pop music, but there is nothing like the lyrics and emotional meaning of the oldies, such as Dion & the Belmonts, Elvis and The Beatles. Most of the Peters’ fans believe Elvis’ music does keep up with modern beats and surpasses it with soulful lyrics and great musicality. A few say they like some modern tunes, such as Elton John and Lady Gaga, but most say the golden oldies will never be forgotten and the music of today does not have enough heartfelt meaning. One such fan, Angela Canillas, 41, said there is no comparison between the days of Elvis and today. Randy Novick, a Rodney Dangerfield sound-alike performer and saxophone player from Howard Beach, has performed in the past with the Peters and said old-time music moves you and makes you feel good. History seems to have repeated itself with decades of followers and historians of the Elvis era, which includes Professor John Covach, director of the Institute for Popular Music at the University of Rochester, thinks Elvis’ music has endured quite well over the last 50 years and people still listen to it and they love the tribute performers. While clapping their hands and often cheering, those attending the packed afternoon performance noted that Lamar Peters comes from a family of performers – his father, Gregg Peters, has been an Elvis Presley tribute artist for more than 35 years. Often giving a bit of history about the songs, Lamar Peters, decked out in an Elvis-inspired white jumpsuit, inspired the music lovers to frequently belt out the lyrics themselves and even jump out of their seats as he sang “Impossible Dream,” “Heartbreak Hotel,” “Suspicious Minds,” “Blue Suede Shoes,” and more. The afternoon concert was funded by a grant from Assemblyman Phil Goldfeder. 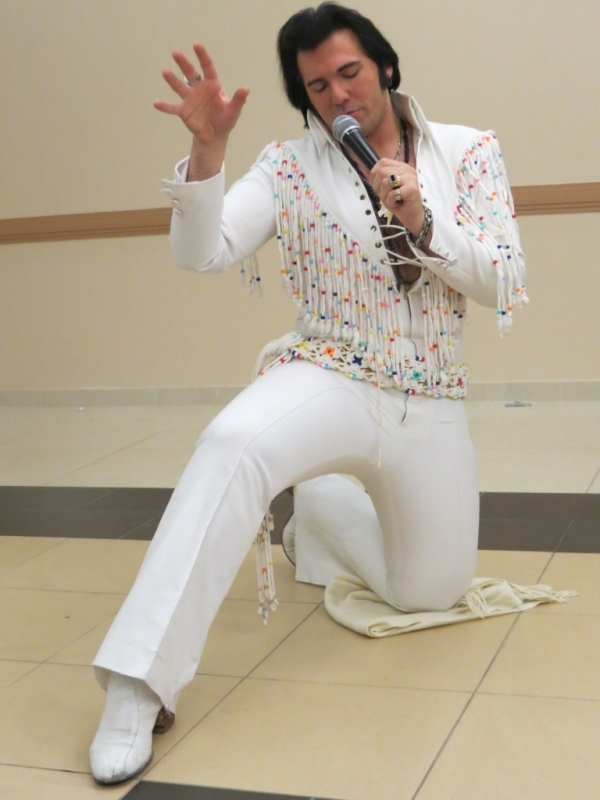 Lamar Peters, who is a second generation Elvis tribute artist, told us that even with GigMasters finding a sense of community among other tribute artists can be hard. 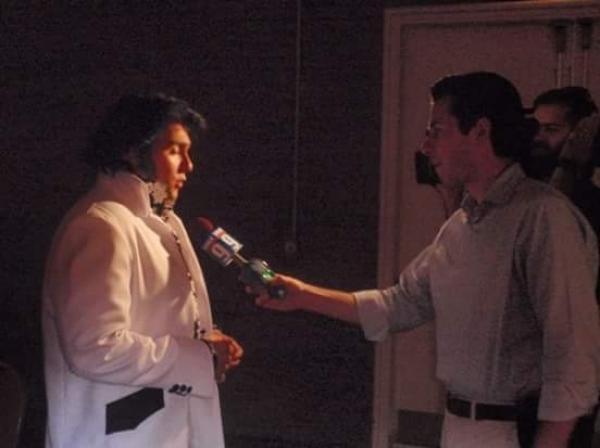 Mr. Peters said he fell effortlessly into the role of Elvis. For one thing, his father was among the first and most preeminent Elvis entertainers on the East Coast. It also doesn’t hurt that, with his olive complexion and coiffed black hair, he shares a striking resemblance to the King of Rock and Roll himself. “I can’t go one day without people telling me ‘Hey, you know you look a lot like Elvis,'” he said. 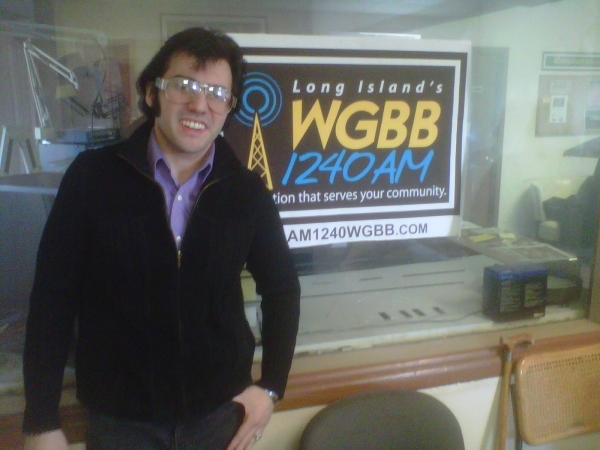 Mr. Peters, a Queens native who was raised among entertainers and has a background in dance, also steps into the shoes of many rock and roll superstars. As part of “The Rock & Roll Review Show,” the 90-minute show he conceived, Mr. Peters performs as Sam Cooke, Johnny Cash and Jerry Lewis. But Elvis remains enduring. “Elvis wasnt a joke. Simply put, he was the best he ever was,” said Mr. Peters. “And so I try to deliver that to my audience . The Liverpool Shuffle performs as part of a double bill with Elvis tribute artist Lamar Peters at Eisenhower Park's Lakeside Theatre on Sunday July 24th 2016.